At 2960 m above sea level the Zugspitze is Germany highest mountain. It lies at the border between Germany and Austria in southern Bavaria and the summit can be reached either by foot or with a cog railway or a cablecar. 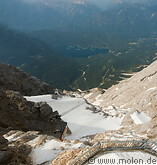 Below the Zugspitze lies a huge glacier. Right next to the summit there is a restaurant, a weather station and microwave relay stations.